A layered salad is the perfect summer dish. Our video has tips on keeping lettuce crisp and how to up the level of Caesar-style flavor with fresh garlic. Mix dressing, mayo and garlic until blended. Place half the salad greens in 3-qt. 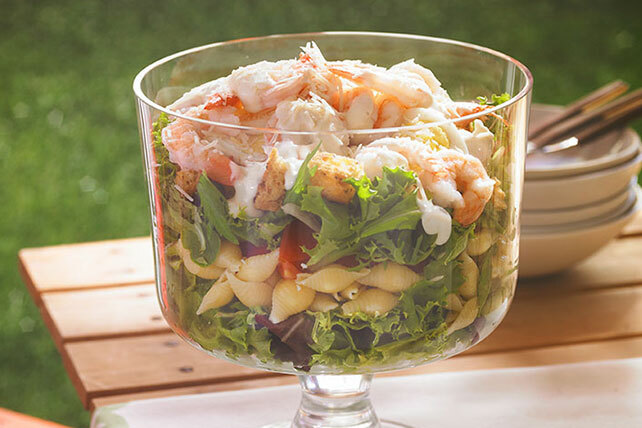 bowl; cover with layers of pasta, tomatoes, remaining greens, croutons, eggs, shrimp and cheese. Refrigerate dressing mixture and salad 1 hour. Add dressing mixture to salad just before serving; mix lightly. Squeeze juice of 1 lemon over salad before tossing with dressing mixture. Season salad with cracked black pepper. Heat 1 Tbsp. olive oil and 1 tsp. minced garlic in medium skillet on medium heat. Stir in 1 cup French bread cubes; cook 3 to 4 min. or until crisp and golden brown, stirring frequently. Cool completely. Salad and dressing mixture can be refrigerated up to 4 hours before tossing salad with dressing mixture just before serving.